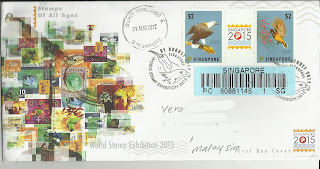 On the week-end of the Tri nations stamp exhibition August 31-September 2, 2012, there was also the launch of these two birds stamps for the World Stamp Exhibtion Singapore 2015. The stamps used this year are reprints of the 1963 definitives when the Sunbird was $2 and the Eagle $5. The 2012 issue has both stamps of $2 each, only the stamps in the souvenir minisheet have $5 each. I received this registered FDC with the pictorial postmark showing heads of each bird, also a local postmark from Bukit Panjang has been applied.